THE COAL DISCHARGING PLANT at the port of Savona in the Gulf of Genoa. Communication between this port and Turin has been improved by the building of a new line between Fossano and Ceva. ITALY is practically the only country in Europe where important new railways have been built during the last twenty years, and where new lines are at present under construction. During the ten years ending 1935, 410½ miles of line have been completed and opened for traffic. To this mileage must be added, narrow gauge lines totalling 212 miles. Further, about 380 miles of railway lines belonging to private companies have been completed during the last twelve years, or are nearing completion. One of the new lines, the Bologna-Florence Direttissima, is described in the chapter “The Great Apennine Tunnel”, which begins on page 320. In the present chapter an account is given of the interesting railway from Fossano to Ceva, which is noteworthy for its fine viaducts. Although this line is only twenty-three and three-quarter miles long, it is of unusual importance. Its completion has improved communications between the port of Savona and the highly industrialized hinterland, including Piedmont writh its capital, the royal city of Turin. Before the construction of the new line the only railway connexion between Savona and Turin was given by the line Savona-San Giuseppe Cairo-Ceva-Bra-Carmagnola. To Carmagnola this line is single track and, especially for the first thirty miles, is steeply inclined, some of the gradients being as severe as 1 in 25. Such a line is unsuitable for heavy freight traffic, and as Savona supplies the whole of Piedmont with coal - mostly from England - it has become necessary to relieve the line of part of the coal traffic by constructing an aerial ropeway from Savona to San Giuseppe Cairo, which lies at an altitude of 1,122 ft. This aerial ropeway has a length of eleven miles, and is supported by 209 concrete towers. The carriers each has a capacity of one ton, and 500 carriers are in continuous movement, half ascending and half descending. They follow one another at a distance of eighty yards every twenty-three seconds. THE ITALIAN STATE RAILWAYS recently doubled the track from Carmagnola to Fossano, and built a new line from Fossano via Mondovi to Ceva. The recently built Fossano-Ceva line has a length of twenty-three and three-quarter miles. 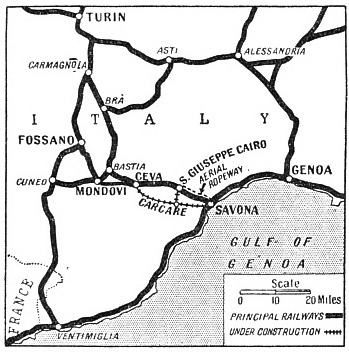 The original idea of doubling the track from Savona to Carmagnola was abandoned because of the difficulties of the route. But a line exists from Carmagnola to Fossano (on the Cuneo-Turin route) which has only moderate gradients, nowhere exceeding 1 in 200. Moreover, all the curves on this line have a wide radius—with a minimum of 875 yards - and the doubling of this track presented no difficulties. The State Railways Administration decided, therefore, to double the track from Carmagnola to Fossano, and to build a new line from Fossano via Mondovi to Ceva, in addition to the other construction between Ceva and Savona. The double-track line from Fossano via Mondovi to Ceva has the following constructional characteristics : straight runs totalling seventeen and three-eighths miles, curves with a radius of not less than 875 yards, maximum gradients of 1 in 145 in the open and 1 in 170 in tunnels, absence of level crossings, and long stations. The first section of the line runs through a plain from north to south. The curves on this section have a minimum radius of 1,100 yards. After the station of Fossano, the line runs through a cutting on a down gradient of 1 in 145, and beyond a long embankment, reaches the left bank of the river Stura, which is crossed by a viaduct 1,640 ft long. It consists of sixteen arches, each having a span of 82 ft, this span being uniform for all the viaducts on the new railway. The line continues through a deep and long cutting which necessitated the excavation of 400,000 cubic yards and ascends a gradient of 1 in 170 to the station of Trinita-Bene Vagienna. The line now runs perfectly straight for two and three-quarter miles and then the railway reaches the station of Magliano. After a short descent the river Pesio is crossed by a viaduct of nineteen arches. It is 1,935 ft long and 200 ft above the level of the river. The track now enters a long cutting crossed by a number of canals and roads, approaches the railway from Cuneo to Bastia, and continues parallel to it for one and a half miles, as far as the reconstructed station of Mondovi, which has been enlarged to serve both lines. At Mondovi, the railway changes direction and runs from west to east. Between here and Ceva the line crosses the extreme northern slopes of the Maritime Alps. The surface is different from that on the other sections. A continuous sequence of hills intersected by valleys or openings is found, and the soil is composed partly of sand and marl, partly of conglomerates of different nature. Numerous gradients and curves, the latter reduced in radius to 875 yards, and several tunnels, characterize this stretch. After leaving the station of Mondovi the line crosses the Ellero torrent by a viaduct 1,640 ft long, having sixteen arches. Passing over several roads, the line then enters the first tunnel, 730 yards in length. Several valleys and torrents are crossed by minor viaducts and, beyond the Rio Bianco, the line enters a tunnel to negotiate the double mountain range which divides the Ellero Valley from the Corsaglia Valley, the distance being two and a half miles. The peculiar conformation of the mountains made it possible to build two separate tunnels instead of one. The first tunnel has a length of 1,231 yards. Beyond a narrow opening is the second tunnel, 3,065 yards long. On emerging from this tunnel the line reaches its highest altitude at 1,491 ft. From here onwards the track descends over a long embankment with a down gradient of 1 in 175 as far as the river Corsaglia, which is crossed by a viaduct 919 ft long, and having nine spans. Embankments and cuttings now alternate. The Mongia torrent is crossed by a viaduct of 1,640 ft, with sixteen arches, and, after passing through two tunnels of 1,418 and 475 yards respectively, the line runs over the Tanaro River on a viaduct of nine arches, and 952 ft long. Shortly afterwards the newly reconstructed station of Ceva is reached. A MOBILE SUB-STATION used on the Italian State lines. This station can be conveyed to any particular point where the high tension supply is to be transformed to the voltage necessary for local purposes. Since its introduction in 1901, electrification in Italy has steadily increased; to-day about 1,300 route miles have been electrified, and further extensions are planned. The extent to which the modern idea of railway construction has been adopted on the Fossano line is apparent from the large number of viaducts, tunnels, and other constructional works on this short line. The six great viaducts mentioned above have a total length of 2,909 yards, and the length of the tunnels totals 6,919 yards; the combined totals representing over one-third of the length of the line. Besides these viaducts there are twenty-five reinforced concrete viaducts over roads and other railway lines, twelve underbridges and eight overbridges, with an aggregate length of several miles. The six great viaducts are the outstanding feature of the line. Italians have always been famous for their viaducts. They have inherited this art from the Romans. The famous Roman aqueduct known as the Pont du Gard, near Nimes in the South of France, is still in use, as are several in the Roman Campagna. The six viaducts all have the same main characteristics. As stated above, the arches are uniformly of 82 ft span. Four arches form one group, which is separated from the adjoining group by a main pier 16½ ft thick at the springing of the arch. The thickness of the intermediate piers is only 9.84 ft. The proportion between this thickness and the span of the arch is therefore only 0.12, which is an unusual feature in view of the great height of the viaducts. The large quantities required and the difficulties of tran sport necessitated the choice of such materials as were to be found in the immediate neighbourhood of the viaducts. Thus for the viaducts over the Ellero, Corsaglia, and Tanaro the piers were built of masonry with stone facing. Those over the Mongia and Stura are of brick, and the one over the Pesio is of concrete with a facing of artificial stone. The accompanying table gives details of the six viaducts. 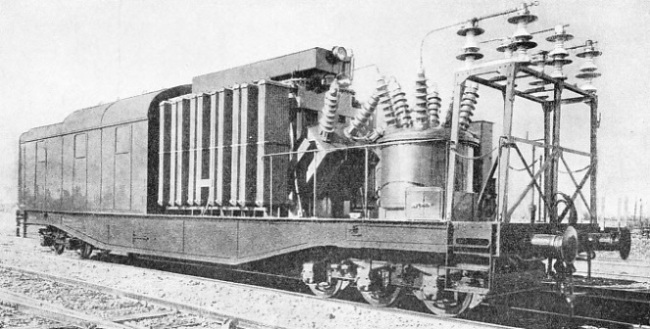 gathered from the fact that it was found necessary to provide also an aerial ropeway 550 yards long, fifteen electric motors, an electric transmission line six miles long, a telephone circuit, a fully equipped mechanical workshop, numerous staff quarters, dozens of sheds for the storage of cement, lime, timber, coal, several garages, and three temporary bridges over the Pesio. The foundations of the Pesio viaduct were laid at a depth of 46 ft, while those of the others are at an average depth of 33 ft. 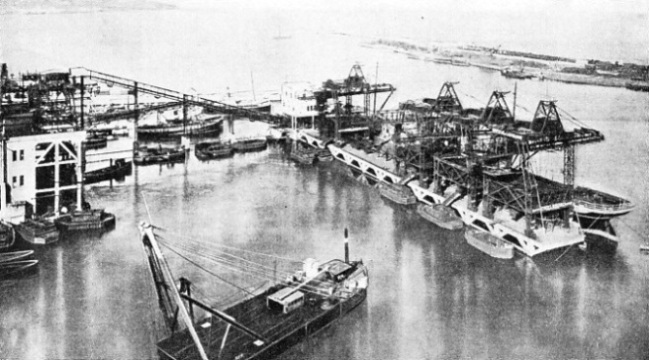 The construction of the viaducts was hampered by the quantities of water issuing from the subsoil and by the fine running sand, which produced cavities at the back of the piling. No particular obstacles were met with in the tunnels. Only in the Mondovi Tunnel the presence of a large pocket of sand and clay heavily impregnated with water offered considerable difficulties. Centrings of exceptional dimensions had to be used and continually changed on this section. All the tunnels have a width of 28.87 ft and a height of 21 ft from rail level to the centre of the crown. In most, inverted arches were set in because of the condition of the soil. Thetotalcost of the line was £3,750,000, or £158,200 per mile. The new line was opened for traffic in October, 1933, and is at present being arranged for electrification on the three-phase system at 3,700 volts, 16⅔ cycles. THE ELLERO TORRENT VIADUCT on the new Italian line near Mondovi. The graceful structure has sixteen spans of 82 ft each. The length of the viaduct is 1,640 ft. The cost of the construction amounted to £151,000. You can read more on “The Great Apennine Tunnel”, “Milan Central Station” and “The Rome-Naples Direttissima” on this website.